ATSIC has been effectively demolished and Indigenous affairs barely rate a mention in the election campaign. Not a single other party has put an Indigenous candidate in a winnable Senate seat. The fact that Indigenous affairs have been pushed off the national political agenda - that Indigenous culture and identity has been dismissed, at best, another part of our multicultural society. and at worst, worthless - is the very reason why I consider race and identity to be such a significant issue. Australian Democrats Senator for NSW, Spokesperson for Industry, Arts, Tourism, Financial Services and Regulation, Centenary of Federation, and Reconciliation. 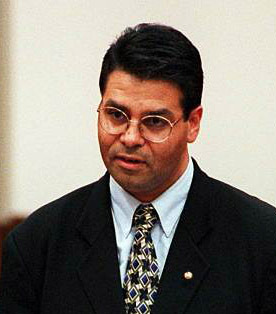 Aden Derek Ridgeway was elected to the Australian Senate for New South Wales, in 1999, representing the Australian Democrats and held to position of deputy leader of the Democrats from April 2001 until August 2002. In 2001, he addressed the United Nations Special Session on Racism and attended the World Conference Against Racism in South Africa. During his term he was the only Aboriginal member of the Australian Parliament. Ridgeway was born in Macksville, New South Wales, as one of the Gumbaynggirr people. After leaving school in Year 11, he worked as a boilermaker. He then became involved in the public service. In this role, he engaged in a number of careers, including being a park ranger and working in several New South Wales government departments. In 1990, Ridgeway was elected onto the first ATSIC Sydney Regional Council, a position in which he served two terms of office. He joined the Australian Democrats in 1991. In 1995, he became the executive director of the New South Wales Aboriginal Land Council and continued in this position until 2000. In 1998 Ridgeway became Chairman of Bangarra Dance Theatre.